Located at the top of Australia, Darwin is the capital of the Northern Territory. With its tropical location, Darwin offers a completely different experience to other parts of Australia. Within the city centre, there is lots to see, including museums, restaurants, and nightlife. Head outside of Darwin and you will find some of the most incredible nature Australia has to offer. Popular spots to visit on a trip to Darwin include Kakadu National Park, Litchfield National Park, Katherine Gorge, and Edith Falls. The Top End is also known for its abundance of saltwater crocodiles. You can learn all about these creatures and even take a river cruise to see them in their natural habitat. Darwin and the Northern Territory offer a unique wildness that you won’t experience near any other major cities in Australia. Start planning your trip to Darwin with Webjet’s Darwin holiday packages. These packages bundle together hotel and flight costs, making the booking process easier while also saving you money. Darwin accommodation and flight packages can save you up to several hundred dollars on your trip to Darwin. With the money you’ll save, you can plan even more exciting activities for your time in the Top End. Booking Darwin holiday packages is quick and easy, so rather than spending time looking for travel deals, you can focus on planning your adventures in Darwin. Darwin packages are a great option for families planning a trip to the capital of the Northern Territory. Darwin is home to one airport, which receives the majority of flights into the Northern Territory of Australia. Darwin Airport (DRW) is located 8 kilometres (5 miles) northeast of the city centre, and offers several transport options into the CBD. Direct flights to Darwin are available from several airports around Australia, including Sydney, Melbourne, Brisbane, Perth, Adelaide, Cairns, and Alice Springs. There are also some regional flights available from small airports such as Broome, Katherine, and Tennant Creek. Airlines that fly domestically into Darwin include Jetstar, Qantas, Virgin Australia, and the regional airline Airnorth. In Darwin, you’ll find a range of accommodation options to meet every budget. There are backpacker hostels, luxury resorts, and serviced apartments to call home during your trip to Darwin. Located on the Esplanade, the Palms City Resort is in the perfect spot for exploring the city. Five room types are available, and each have a tropical flair to them. You can pick between one of their hotel rooms or a gorgeous villa. Several amenities are available to guests of the resort, including a swimming pool, cafe, complimentary parking, and WiFi. Surrounding the hotel are some tropical gardens that will have you feeling like you’re much further from the busy city centre than you actually are. The Metro Advance Apartments and Hotel will have you feeling right at home in Darwin. Studio, 1-bedroom, and 2-bedroom apartments are available. Each apartment comes equipped with air conditioning, a kitchenette, and laundry facilities. Other amenities that hotel guests can enjoy are an outdoor swimming pool, onsite parking, and breakfast. This spot is a popular accommodation option for families visiting Darwin. This hotel is the perfect place for budget travellers to experience a taste of luxury. 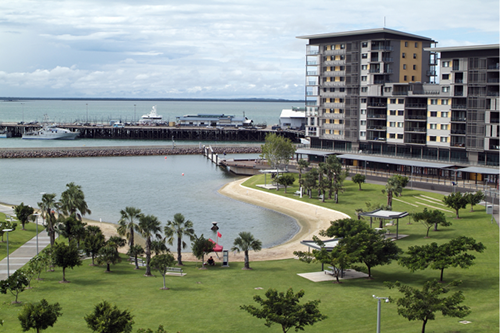 It is located right beside the Darwin waterfront and is a quick walk to all the action of the CBD. The hotel consists of 121 guest rooms that offer a simple but stylish design. Many rooms also overlook the waterfront. Within the hotel, there is a restaurant, gym, free WiFi, and a gorgeous outdoor swimming pool. Darwin is a tropical city with a different feel to the other capital cities in Australia. The city itself is compact and walkable. There are some great restaurants as well as a vibrant nightlife. Outside of the city, the Top End has a ruggedness and wildness to it. You can visit national parks, such as Kakadu and Litchfield and witness the region’s famous crocodiles in their natural habitat. Saltwater crocodiles are common throughout the Top End of Australia. While you don’t want to run into one in the wild, Crocosaurus Cove offers the opportunity to learn more about these terrifying but magnificent creatures. While visiting Crocosaurus Cove, you can watch crocodiles eat, hold a baby crocodile, and get lots of information on crocodiles from the knowledgeable staff. If you are feeling brave, you could also go into the Cage of Death. It is a large glass cage that gets lowered into the tank of a massive crocodile so you swim alongside it and see it up close. For a tropical beach experience, Mindil Beach is the place to go. Within walking distance of the CBD, the beach offers beautiful views of the ocean. You can take a stroll along the beach and go for a swim (in the designated areas in case any crocodiles are lurking nearby). Mindil Beach is especially beautiful to visit during sunset, and if you visit during the city’s dry season, you can check out the Sunset Market at Mindil Beach. The entrance to this national park is about an hour and a half from central Darwin, making it a great option for a day trip. Throughout Litchfield National Park, you can see waterfalls and the Darwin area’s famous termite mounds. Some popular spots to see within Litchfield National Park are Florence Falls, Wangi Falls, the Buley Rockhole, Tolmer Falls, and the Blyth Homestead. Many spots in the park are safe for swimming during the dry season. But as always in the Top End, be sure to check signs to make sure the water will be free of crocodiles.